When I became Children’s Commissioner for Wales I asked children and young people to tell me their priorities through my What Next consultation. Bullying emerged as the issue of highest concern but to tackle this I wanted to find out what children and young people really mean when they talk about bullying. To research this, my office has consulted with nearly 3000 young people, who are involved in our Ambassadors schemes, through creative activities, asking children to portray bullying through drama, pictures and creative writing, and more than 400 professionals. Unsurprisingly, cyberbullying is a significant theme and many young people described the types of bullying endured through direct messages or social media. Two teenage girls in Ceredigion told my team about how continuous comments online and offline about appearance causes self-doubt and extreme dieting. A Year Seven class discussed videos of physical bullying that were shared on phones – more than half the class had seen one of these videos. Occasionally young people would admit to cyberbullying, often saying that they joined in with ‘everyone else’. This echoed the many young people we spoke to throughout Wales who expressed anxiety about how to stand up to bullying, not wishing to get sucked into joining in with it or to become victims of it themselves. As young people’s descriptions reveal, cyberbullying often occurs alongside other experiences of bullying, as illustrated in the cartoon below. It got me thinking about whether recognising that cyberbullying is often experienced alongside other bullying might be helpful in tackling the issue. 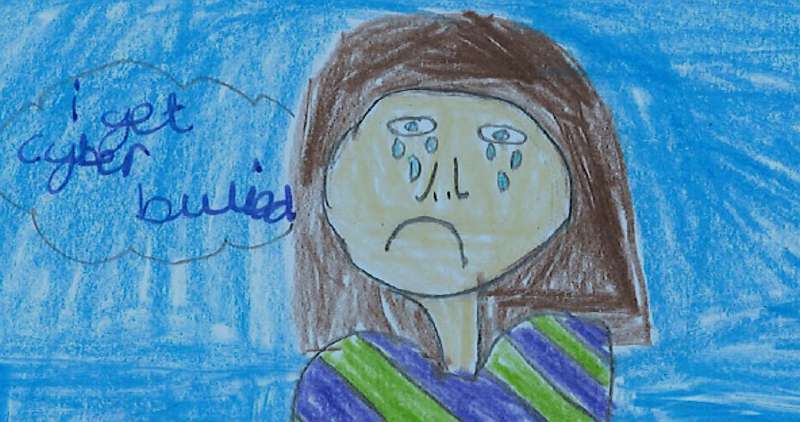 Picture submitted to Children’s Commissioner to Wales by primary school pupil. The images shows online comments accompanied by the same comments offline. Many schools in Wales have developed a Children’s Rights Approach to create a school environment in which children’s rights and wellbeing are central. This includes the rights to be safe, not to suffer discrimination, for privacy and to be listened to. My office is publishing guidance around this approach in our forthcoming Children’s Rights Approach to Education, which will be launched later this month (18 May). The case studies in this guidance illustrate that in an environment in which rights are central, bullying is inhibited as staff and pupils develop a shared understanding of appropriate relationships and behaviour. These relationship skills can be taught and practiced in schools as well as at home – empathy, tolerance, listening skills, recognising and expressing feelings and conflict resolution. Schools can create environments where diverse identities are celebrated and oppressive behaviours as likely to be clamped down on by peers as by staff. To many young people, there is little distinction between their online and off-line worlds. They inhabit both almost constantly. Children and young people should be empowered with the knowledge that they have the same rights online as offline. The Digital Competency Framework is implicitly underpinned by children’s rights but I would recommend that teachers in Wales go further and bring children’s rights to the forefront of their approach to the Framework, particularly in their approaches to developing outcomes of the citizenship strand. To explain this further, my team will be sharing a taster of how schools can bring a Children’s Rights Approach into digital learning at Hwb’s National Digital Learning Event on the 21st June. Reports of the tragic consequences of cyberbullying have rightly led to concerns about how education settings in Wales best support pupils. It is crucial that we safeguard the long term needs of children by putting children’s rights at the centre of all the environments they inhabit, and this includes the digital environment. Empowering young people with an understanding of their rights is a fundamental step in protecting their welfare, both online and offline. Click here to register for Hwb’s National Digital Learning Event. Contact us to find out more about our forthcoming Children’s Rights Approach for Education.